This chromolithograph is taken from plate 30 of William Simpson's 'India: Ancient and Modern'. 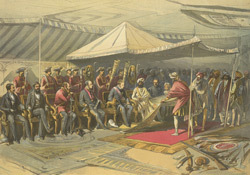 It illustrates the return visit made by Viceroy Lord Canning to Maharaja Ranbir Singh of Kashmir on 9 March 1860, during the viceroy's progress through upper India. The Maharaja had come to meet him a day earlier. The Maharaja's tent was decorated with cashmere shawls, and silk and gold materials were placed beneath the chair reserved for the viceroy. Beautiful, detailed watercolours such as this provided vignettes of contemporary ceremonial life in India for people in Britain.